Feeling great and enjoying a bit of pampering doesn’t have to come with a high price-tag and, let’s face it, we all deserve a pamper once in a while. Forget the spa because hidden at the back of your kitchen cupboards are numerous everyday products that can boost your beauty regime or act as stand-ins if you’re low on supplies. As kids we were equal parts repelled and impressed when our grandmothers spun tales of homemade stockings – a natty mix of gravy browning and a neatly drawn ‘hem’ up the back of the leg! There’s a lot to be said for that sort of ingenuity and that’s what this blog is all about. 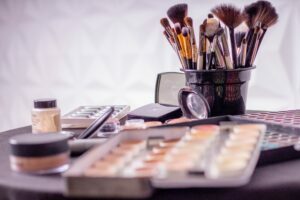 Whether you’re on a low budget or have run out before a night out we’ve come up with a list of products that can replace high-end beauty products with items you already have in the drawer. Honey has fantastic antibacterial qualities that can hydrate skin and minimise breakouts, making it perfect for a face mask! Honey is really gentle on sensitive skin, and Manuka honey can even reduce scarring. Granulated sugar and table salt are part of any pantry and if you mix them with olive or coconut oil, you can make a great scrub to keep your lips kissable! You can add a few drops of your desired flavouring if you want to be really fancy. Peppermint essential oil is also a great addition as it makes your lips tingle and provides a perfect pout! Yep, you read that right. There are so many products promising to keep your hair sleek and exactly in place, but they’re generally not that successful at it or are massively overpriced. A quick swipe of a tumble dryer sheet over your ‘do will tame flyaways caused by static in an instant! The best part is, they take up almost no space in your handbag! For most people in the working world, we spend nearly forty hours a week in front of a computer screen, which can be a real strain on the eyes. In order to soothe aches, reduce puffiness and tighten the eye zone, stew two green tea bags and allow to cool. Once cold, rest each under an eye for up to ten minutes… and perhaps enjoy a power snooze. Lots of recipes for making your own body scrub are time-consuming and messy, which more or less defeats the object. All you need to do to buff your body smooth is to add two spoons of raw brown sugar to your favourite body wash before massaging skin in circular motions – you will glow! If you have dry and irritated skin or you’re suffering with mild sunburn, add a handful or two of porridge oats to warm bath and enjoy a long soak. Oats contain fats and sugars that are deeply moisturising and help to ease discomfort. If you prefer a cold breakfast, Greek yogurt is also fantastic for treating some skin complaints, namely sunburn. We’ve saved the best until last: coconut oil. It truly is a wonder-ingredient, rich in fatty acids and proteins, so you can absolutely believe the hype. It makes for a fabulous makeup remover even on waterproof mascara, and doubles up as a great moisturiser – slather it all over dry elbows or knees and enjoy how silky they feel after a few weeks! Where this product really shines though, is in your hair. It makes an amazing hair mask to soften hair before washing, but make sure you use a deep cleansing shampoo to clear away excess oil that would make hair feel greasy. Running sparingly through damp ends once clean can also help create a smooth, glossy style.